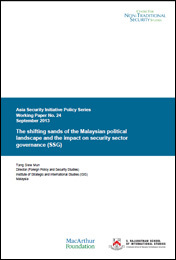 The Malaysian security sector is undergoing a major transformation as the Najib administration implements a series of reforms that expand political space and discourse. This paper examines these changes, and argues that the net effect is to loosen the government’s grip on governance. It suggests that unless there is a corresponding development of political culture, namely, consolidation of the rule of the law and respect for political and legal processes, the polity may become increasingly unstable.